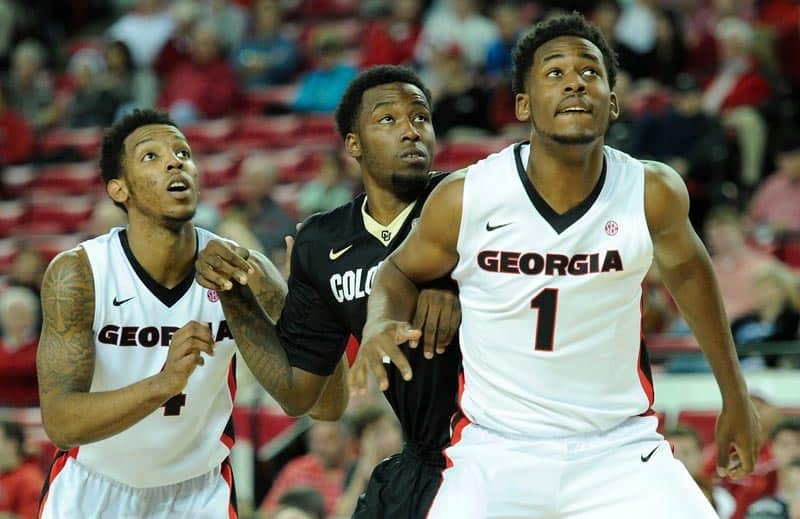 ATHENS, Ga. – Sophomore guard J.J. Frazier tied a career high with 15 points, 12 of which came in the second half, as Georgia defeated Colorado 64-57 at Stegeman Coliseum on Sunday December 7. Georgia (5-3) had four players score 10+ points on the day. Marcus Thornton (16), Juwan Parker (10) and Charles Mann (10) all joined Frazier with double-digit scoring performances. Frazier did not miss a shot in the game, connecting on all three of his field goal attempts (all three-pointers) and all six of his free throw attempts. As a team, the Bulldogs shot 43.8 percent from beyond the arc, their second best performance of the season. The Bulldogs closed out the first half on a 12-0 run over the final four minutes to take a 34-22 lead into the locker room. A Thornton tip-in started the run after a 3-pointer by Colorado’s Xavier Johnson, which proved to be the Buffaloes’ final field goal of the half. The lead changed eight times in the first half. Georgia shot 54.2 percent from the field and connected on 4-of-9 shots from beyond the arc compared to Colorado’s 37.5 percent from the field and just 1-of-7 from deep. Both teams struggled at the start of the second half, scoring just seven collective points over the first 7:30. Colorado’s Askia Booker and Josh Scott led a comeback attempt for the Buffaloes down the stretch, battling to within six with 1:07 remaining. Frazier and Parker were able to close the game out for the Bulldogs as the two combined for seven free throw makes within the final 1:06 to seal the win. Booker led Colorado (5-2) with 20 points on 7-of-19 shooting; Scott added 18 points and 11 rebounds for his third double-double of the season. Johnson tallied 10 points and was 2-of-7 from beyond the arc. · Georgia’s starting lineup was: Marcus Thornton (68th career start), Nemanja Djurisic (33rd), Juwan Parker (11th), Charles Mann (48th) and Kenny Gaines (38th). · This was the tenth meeting between the Bulldogs and the Buffaloes. Georgia leads the overall series 7-3. Colorado had won the two previous meetings between the schools. · Georgia is now 4-0 on the season when playing at Stegeman Coliseum. · Georgia had its second best shooting performance of the season from three-point range, connecting on 7-of-16 attempts (43.8 percent). It was the Bulldogs’ third best overall shooting performance of the year (47.7 percent). · Georgia seized the lead with 3:46 remaining in the first half and held the lead until the final buzzer, leading for a total of 29:45. · J.J. Frazier tied a career high with 15 points, 12 of which came in the second half. He last scored 15 vs. Louisiana Tech in the second round of the 2013-14 NIT (3/22/14). · Frazier tied his career highs in free throw attempts and makes. · Juwan Parker attempted a career-high 10 field goals, connecting on three of them and finishing with a season-high 10 points. · Parker also tied a season high in free throws made, going 4-of-6 from the stripe. Georgia will have two weeks off for final exams but they will resume action on December 21 when the Bulldogs play host to Seton Hall at 6:00 p.m. at Stegeman Coliseum. The game will be televised on ESPNU.